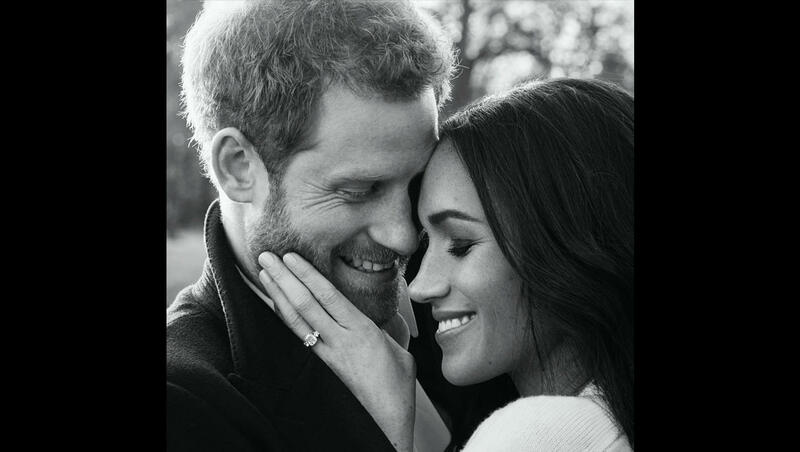 Prince Harry and Meghan Markle unveiled their glamorous engagement photos. Kensington Palace released the images, taken earlier this week at Frogmore House, Windsor. Kensington Palace initially released two official photos by fashion and celebrity photographer Alexi Lubomirski, then followed up with a third, "candid" shot. The photos are a departure from Prince William and Duchess Kate's more staid engagement photos. Unlike Kate's knee-length cream dress, Markle is wearing a sheer embroidered gown by Ralph & Russo, reports Vogue. One of Markle and Harry's portraits is particularly intimate, with Markle and Harry touching foreheads as she holds his face. Both official portraits show off Markle's ring, which includes a center diamond from Botswana and side diamonds from Princess Diana's personal jewelry collection. Kensington Palace said that the couple was so pleased with the public's response to the official snaps that they decided to release a candid, saying, "As a way to say thank you, they have decided to share this candid photograph from the day of their portrait sittings directly with all of you." On Wednesday, Markle was seen arriving for Queen Elizabeth II's pre-Christmas lunch at Buckingham Palace. The couple announced their engagement Nov. 27. They are set to marry on May 19 at Windsor Castle's St. George's Chapel.